Is your foot neutral, flat or high arched? 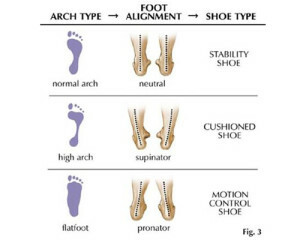 Low arches or flat feet (pronators) tend to have flexible feet so this foot needs maximum stability and control. Avoid highly cushioned, highly flexible shoes. 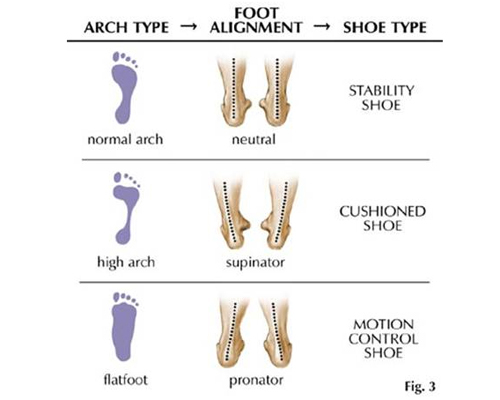 The high arched foot (supinator) tends to be more rigid and cannot absorb shock well so this foot needs a highly cushioned sole with maximum shock absorption plus a great deal of flexibility to facilitate proper foot motion. Stay away from heavy motion control shoes that can make gait unstable. Neutral-arched feet aren’t overly arched or overly flat. Look for shoes with firm midsoles and moderate rear-foot stability. The American Orthopaedic Foot & Ankle Society recommends that women not wear a shoe with a heel higher than 2 1/4 inches. Try to wear reasonable heel heights on a daily basis and save the higher heels for a special night out and try not to wear them for more than three hours. Wearing heels frequently for long periods of time can shorten the Achilles tendon and causes a loss in the range of motion in your feet. This is responsible for the disproportionate number of American women who suffer from heel pain compared to men. There are home exercise programs that stretch the Achilles tendon and plantar fascia stretching. If done regularly, these simple exercises can help reduce the pain in your feet. Be aware that foot discomfort can be caused by problems other than improperly fitted shoes or genetics. Your feet are often a good indication of your general health. Swollen ankles may be a sign of congestive heart failure. Feet that have an insensitivity to pain and temperature can be an indication of diabetes. Cold feet may be symptomatic of circulatory disease and clubbed toenails may indicate chronic respiratory disease.